Deadpool 2 just won't quit. First we learned about the Super Duper Cut coming to Blu-ray, which is an extended version of the sequel. Now certain copies of the impending home release will include a raunchy kids' book that is definitely for adult eyes only. Like its predecessor, Deadpool 2 engaged in a long and entertaining marketing campaign that kicked off all the way back in March 2017, over a year before the movie came out. And true to form of the original, even though the sequel has already torn its way through theaters, it will continue selling itself through its home video date. You'll be able to get Deadpool 2 in your grubby little hands on August 21, with the sequel perfectly bookending summer with its theatrical and home release. If you're a Target shopper, and plan to pick up the Blu-ray there, you're in luck. The retailer is offering the exclusive illustrated A (Not Suitable for) Children's Book. It's not just some little throwaway freebie, either. This thing arrives at 24 full pages, and is written in the voice of Ryan Reynold's signature character Wade Wilson. The book comes attached to copies of the 4K Ultra HD and Blu-ray of the Super Duper Cut. The extended version of the movie contains a full 15 extra minutes of deleted footage, which is quite a lot. The release is already available to preorder at Target, if you're brave enough. According to the order page, more special features will be revealed at a later date. 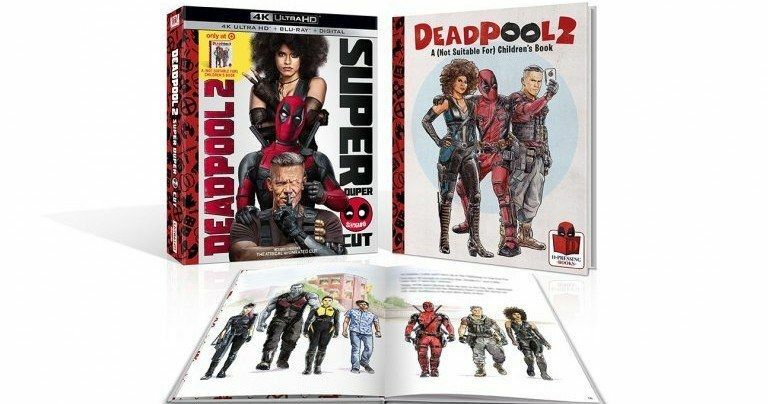 It was announced earlier that the Super Duper Cut is going to /deadpool-2-uncut-screening-comic-con-2018/debut at Comic-Con next week. Even though the movie is almost out of theaters, the Deadpool 2 panel in Hall H is one of Friday's biggest draws. The event is promising plenty of fun surprises and maybe even a few announcements about future movies. The panel happens in the afternoon, with the Super Duper Cut screening later that night. You can check out a few pages from the A (Not Suitable for) Children's Book below. They recreate key moments from the sequel as narrated by the hero himself. Deadpool 2 was a big hit at the box office, pulling in $727 million to become one of the highest grossing R rated movies of all time. If you want this cool collector's book, you better strike up that pre-order while its hot, or get your booty down to Target on August 21. You don't want to be left out in the cold on this one.